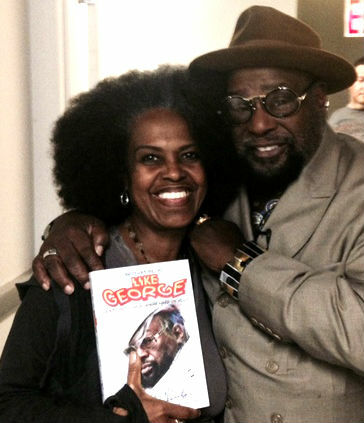 Malaika with George Clinton of the Parliament Funkadelic. They are posing with his book Brothas Be, Yo Like George, Ain’t That Funkin’ Kinda Hard on You?—which she signed and edited. Matthew 5:5 of our Bible says, “The meek shall inherit the earth.” In the case of American world literature (sometimes called “black literature”), the meek are the salt of the earth, if not the earth itself. Malaika Adero doesn’t call a lot of attention onto herself. She does her work methodically and pointedly, beautifully, year after year, decade after decade without a lot of fanfare. Isn’t that how angels operate though? All you see of Malaika are the volumes of books that she has birthed as well as the regular celebration of our global village griots and ancestors under the expanse of large colorful wings. This is royalty. She is part of the 13th-century continuum of West African history from those kingdoms of Ghana, Songhai and Mali. She comes to us from the tradition of the griot—a story teller or praise singer who is a historian and often seen as a community and cultural leader, often times an advisor to persons of royal designation (think Miles Davis, Nelson Mandela, Prince, Toni Morrison, or Spike Lee amongst countless others). Malaika has been and is all that, now. Malaika has spent nearly 40 years in the aforementioned publishing industry. 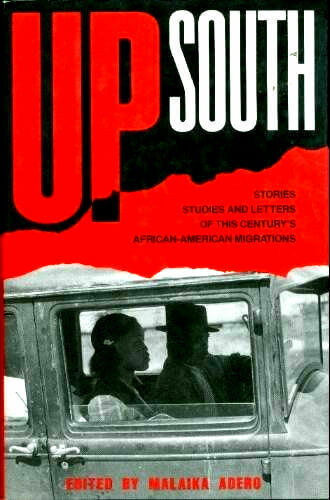 Born in Knoxville, Tennessee, Malaika was an inaugural student for Publishing Institute at Howard University in 1980. Since then, she has worked on dozens of novels, including many New York Times best sellers, with authors such as Common, Blair Underwood, Reyna Grande, T.D. Jakes, George Clinton, Nelson Mandela, James Meredith, Victoria Rowell, and Zane. One of her early and most celebrated projects was Miles: The Autobiography with Quincy Troupe which won the 1990 American Book Award and for whom Quincy Troupe and Miles Davis acknowledged Malaika not only for her co-editing but bringing the idea to Simon and Schuster for publication. That classic was published on September 15, 1990, almost 30 years ago. 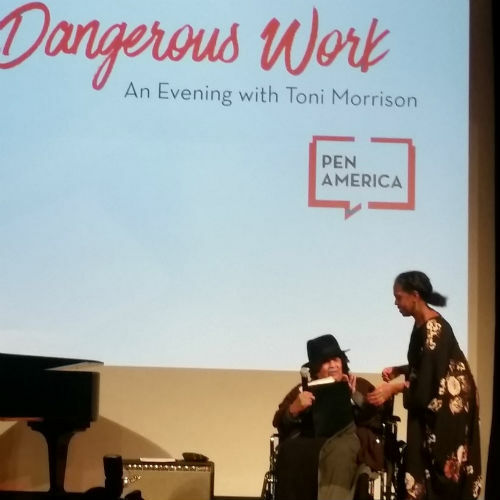 Just last week, however, Malaika curated a tribute at the New School for Toni Morrison, winner of the 2016 PEN/Saul Bellow Award for Achievement in American Fiction. Within the world of literature and Big Five Book publishers, the name, ‘Malaika Adero’, is golden, like royalty. ‘Malaika Adero’—non-stop, don’t stop, can’t stop—it’s a legacy thing and she, the ‘djeli’ as griot is written in french, is a movement. She moves, it happens. Volumes of knowledge, wisdom and systems just drop. 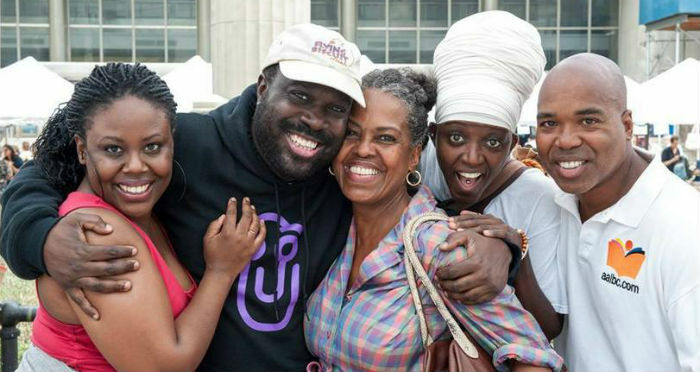 The first time I met Malaika was in 2014 at Harlem Book Fair. I sat next to her as Max Rodriguez, the executive director of the Black Book Review and Harlem Book Fair, introduced her to the world through C-Span. She didn’t know who I was. As a matter of fact, I had to introduce myself to her for this article. But I knew who she was—Yessir! I mean, YesMaam! I was flattered by Max [Rodriguez’s] invitation asked me to make this talk. He calls me up and just says so casually, I’d like for you to talk about the state of black literature in 15 minutes… How was I going to talk about this thing we call black literature, this thing we call publishing? Particularly at this time when it’s so complicated, there are so many issues, there are so much breakthroughs , so much extraordinary work, there are so many problems. So what exactly will I be talking about? I will be talking about black people, meaning people of African descent here writing and publishing primarily in America and that reach the rest of the world. He and I are on the same page to think in terms of “Global I Am”. It is how I think. It’s how most of the people that are around me think. It is how we need to be thinking more in a systematic fashion in order to reach more people, touch more people, advance our culture and heal the world really. So I can’t think of it as a single state. It’s more like the world of story telling. Toni Morrison not only opened doors to others when she began to publish, she has also stayed grounded in the issues of her time. At every turn, she has commented upon and enlarged the conversation about what it is to be black, female, human, universal. Her brilliant and bracing fiction continues to address what is crucial, timely and timeless. The event, an expansion of the expression of literature, featured the talents of actress Adepero Oduye reading from The Bluest Eye; actor Delroy Lindo reading from Song of Solomon; jazz pianist Jason Moran, guitarist Brandon Ross and mezzo-soprano Alicia Hall Moran performing Round About the Mountain; and was MC’d by Master of Ceremonies Kevin Young, Director of the Schomburg Center for Research in Black Culture. In 13th Century Mali, the West African Empire, griots would perform as court musicians relaying wisdom and proverbs through epic song, poetry, and story. This might be the 21st century but not a lot has changed in the 9 millennium. I wondered, sitting next to Malaika that day at the Harlem Book Fair, why aren’t her praises sung loudly and clearly within the national conversation we are always having about ourselves as Americans? ‘I want more books from her’ is what a voice from within said as light and clearly as the day is bright. As recently as this week, I wondered again with the vitriolic presidential campaign squared around race (Make America Great Again— Really? ‘Cause I don’t think it has ever been as great as it is now and is gonna be) and with the beacon call for elemental humanity and healing in our #BlackLivesMatter movement. I wondered because Malaika already noted during her 2014 keynote, “It [Global I Am] is how we need to be thinking more in a systematic fashion in order to reach more people, touch more people, advance our culture and heal the world really.” Do we really want to solve this thing and move forward into a future power era, the one that is already here, struggling to be born? We are the ones whose time it has come to lead, who must rebuild. We are the ones with the choices to be made. We have to choose the future we want, the quiet future already here, with collective peace, dialogue, and understanding. “I Aam Global”, right? Our global village elders have made clear their wisdom. We have learned the valuable lessons with the legacy of Zora Neal Hurston and the Harlem Renaissance. We will not make that error again during the Global International African Arts Movement (Global I Aam). This is a different generation and a different time. Alice Walker resurrected sister Zora Neal Hurston from obscurity with her come up with The Color Purple. We do our business now- take payment now and tomorrow. Take note, this is royalty. At this point in her career, Malaika Adero is an institution onto herself—a walking, breathing, institution. Under her wings are libraries of books- cosmic stories better suited to ancient hieroglyphics told in American English and cosmic happenings told plainly, printed on paper and at the higher frequencies of e-books- the stories of our people preserved in perfect editorial form for the future power world that arises from our Now. Malaika Adero’s name fits nicely in a long line of other djeli, other cosmic soul sisters loosed from earthly constraints—names like Makeda, Ida B. Wells, Phillis Wheatley, Zora Neal Hurston, and June Jordan. This is royalty. Malaika Adero, is currently working on her own book, is the editor of Home Slice Magazine and founder of Adero’s Literary Tribe/ALT.